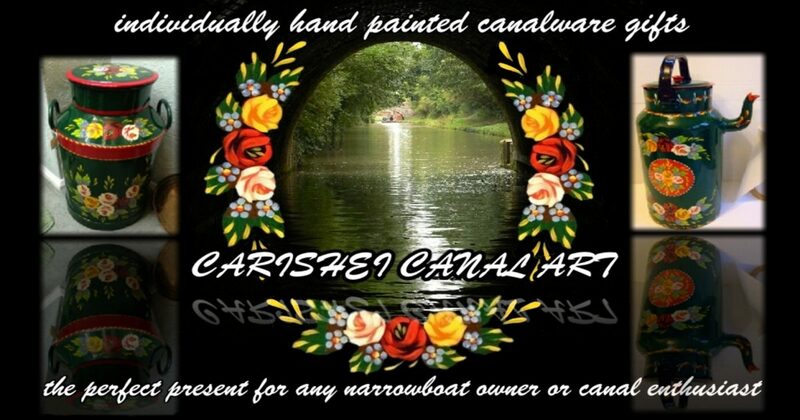 My name is Paul and ‘Carishei Canal Art’ is a very small-scale family business. I am gradually learning the canal boat art craft myself. It’s my Mother Sheila that especially created these beautiful up-cycled works of art since 1996. 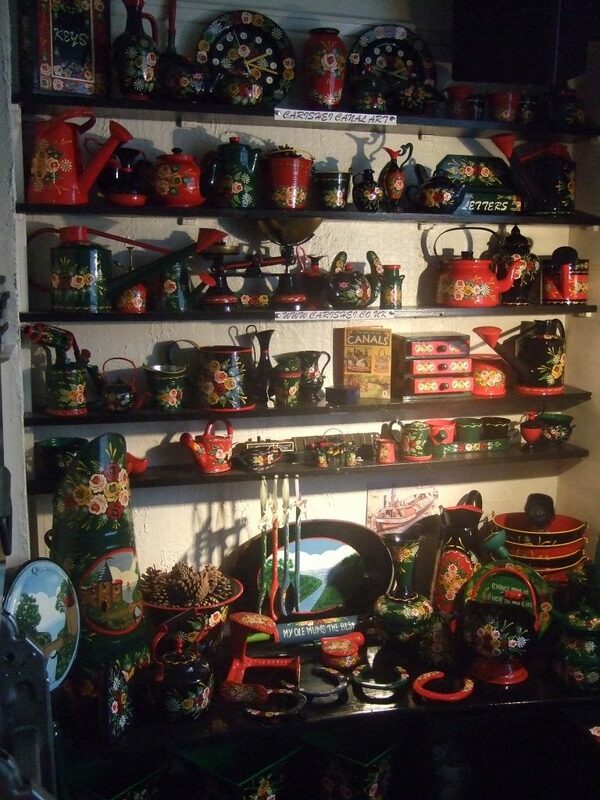 These delightful canalware items make the perfect gift for any canal holiday fan, narrow boat owner or enthusiast. 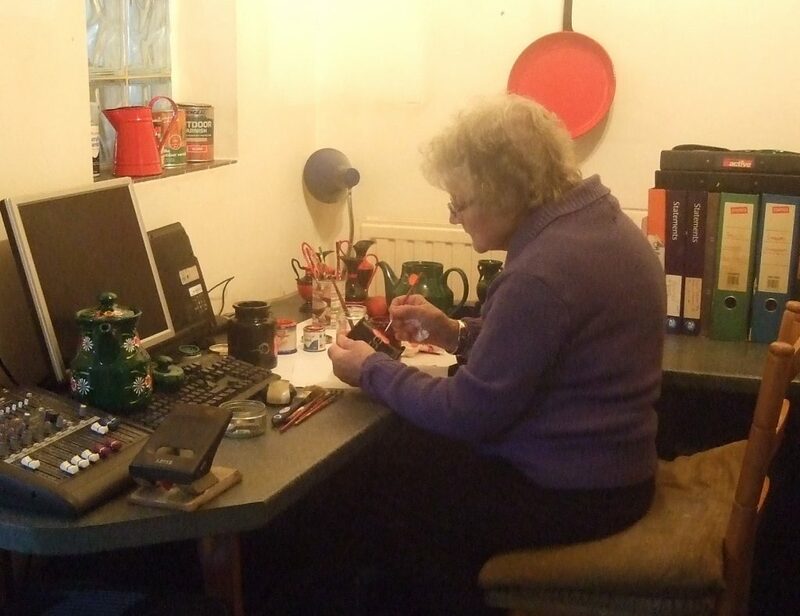 Sheila has been a keen follower of canal boat art since the early seventies. Dad John has been kept very busy over the years preparing objects for painting. Finally since 2014 I’ve been building this website and trying out various storefronts. 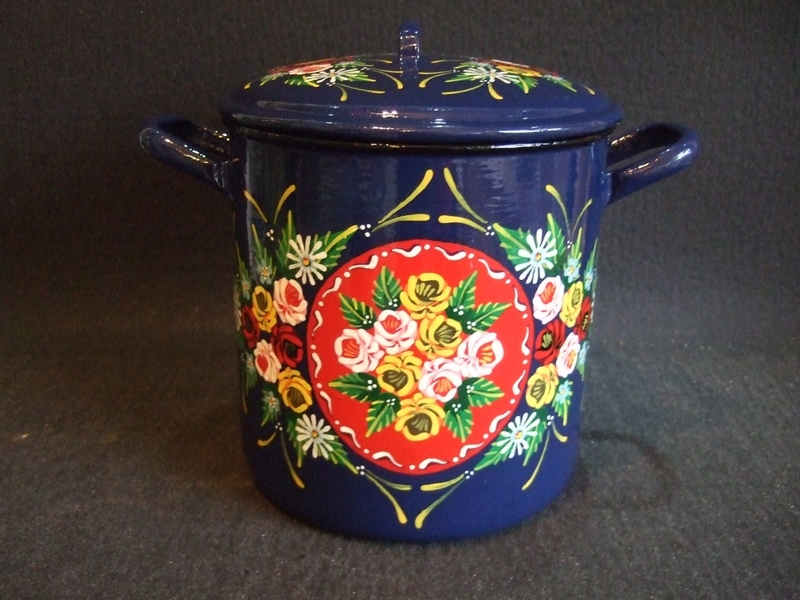 The unusual trading name “Carishei Canalware” is derived from the forenames of the three originally intended associates. Carol, Chris and Sheila. When trade was tough going I’m unsure why Mum (Sheila) kept going? Generally though she says it is simply relaxing. Created by my Mum and Dad (John) Since 1996. 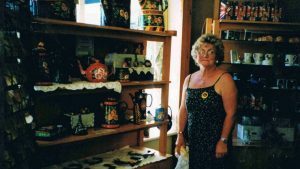 They crafted these traditional ‘Canal Art’ folksy items from pre-loved vintage wares and sold them around various Kent craft fairs. 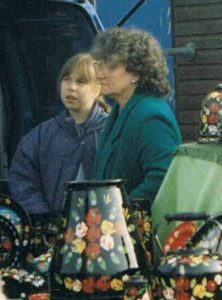 Mum is pictured here with Grand Daughter Michelle at the very first craft fair in Walderslade, Kent during early 1996. 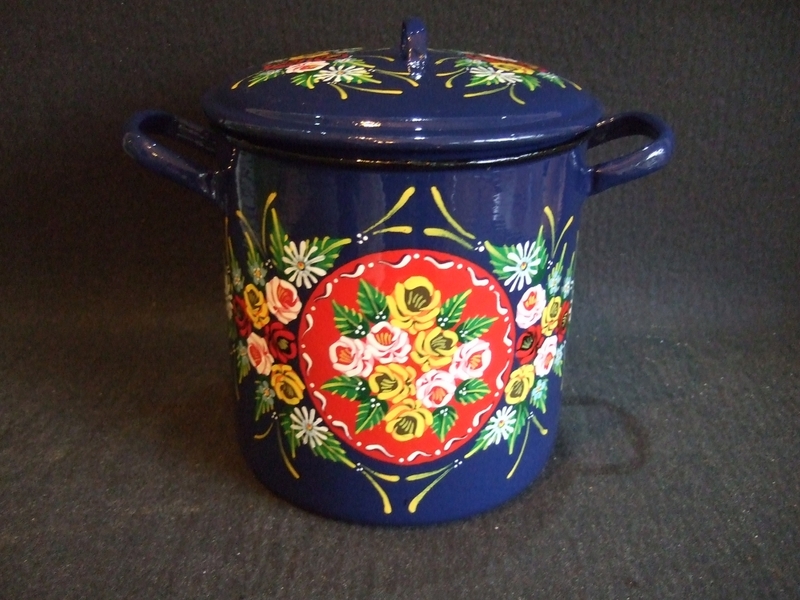 In 2014 I listed just a few delightfully up-cycled items of canalware for sale online for them, it was more of an experiment really. Proving more successful than expected, Carishei continues trading online to this day. The craft fairs mostly made a loss. Eventually they settled at a solitary stall in the gift shop of Kent’s ‘Hop Farm, Paddock Wood’ but due to a restructure of this business in 2012 were pretty much surplus to requirements despite so many fans of their work. That said, after the deductions for the gift shop margin and vat there was no real profit. In fact it seems to me it was a loss making labour of love really. To be honest, Kent is not exactly known for it’s canal heritage. I know of a short canal off the Thames at Gravesend but in traditional terms that’s it. We do have some navigable rivers down here, notably the River Medway. There is also the Napoleonic era Military Canal on the east coast but not connected to the network. Let us not forget that much of the logistic support for the Napoleonic War victory was aided by the canals. 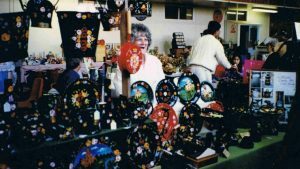 Sheila and canalware at the 1996 Summer Craft Fair at Paddock Wood in Kent. Mum (Sheila) and Dad (John) are not really Internet savvy and had a shed full of old stock. I thought I’d try to sell their remaining items online for them. Web design is my line through my business NetStyle Graphics so this was a natural step really. Many of these hand-painted upcycled items are extremely old and some are antiques so certainly have all the signs of their age making them particularly charming. 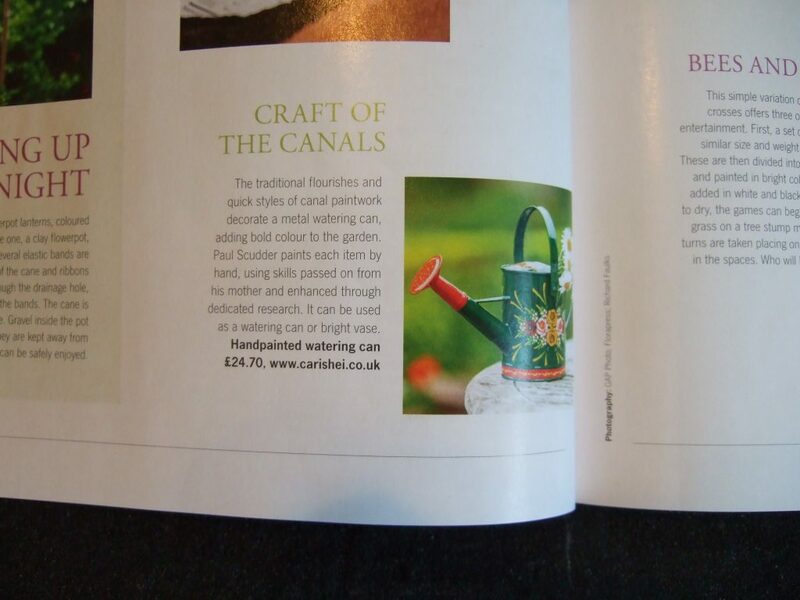 Online canalware sales have proved much more viable while not especially lucrative but, a fun exercise nonetheless. Reading some of the feedback to Mum over the phone has been quite emotional at times. Dad did most of the hard work making, sanding, drilling, filling, repairing, varnishing etc. While Mum enjoyed the decorative painting. Obviously we do have this website but all sales are conducted exclusively through etsy.com/carishei now. For a while our wall clocks were available on their Amazon listing but expansion on that platform proved far too complex. 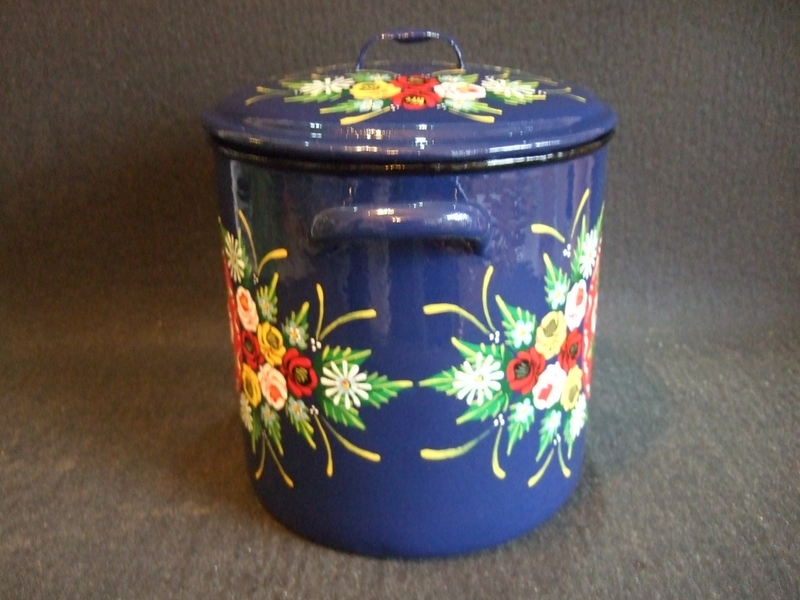 We don’t have high sales capacity for our buyers, so as a low volume seller etsy.com/carishei is much more suitable. These delightful items make the ideal gift for any narrowboat owner or canal enthusiast. Mum really gets a thrill from feedback so I hope this continues to work nicely for her. Items sold in the craft shop by nature never generated any feedback and Mum didn’t meet the buyers. 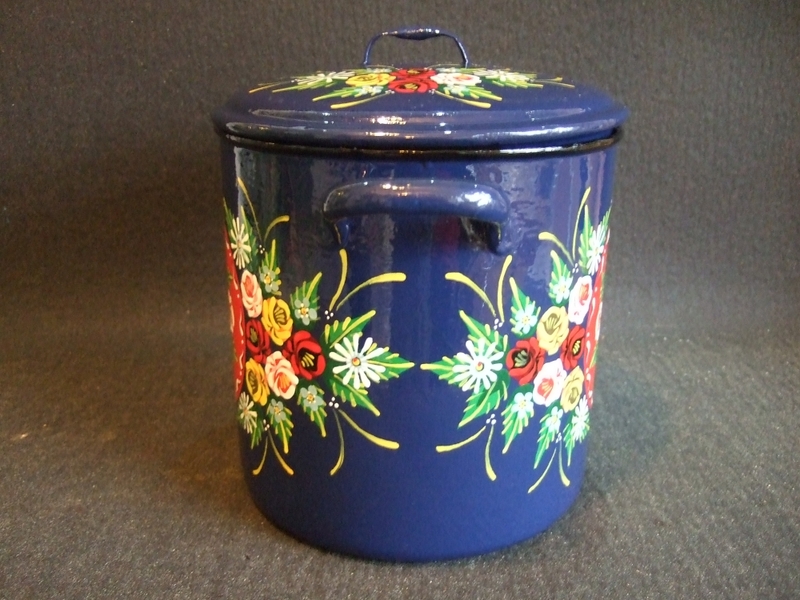 Feedback and reviews for items we’ve sold via Etsy are always welcome. Previous reviews can be read here. While she’still able, Mum is trying to pass her skills onto me in order that ‘Carishei’ continues. Furthermore I’m very thrilled she has recently approved my first piece worthy of her high standards. 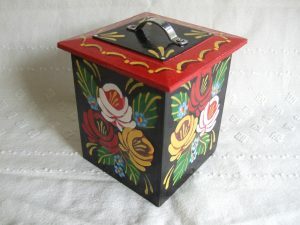 The piece is a medium sized air-tight tea caddy in black with roses on all four sides. I hope this will be the first of many to be added to the storefront. 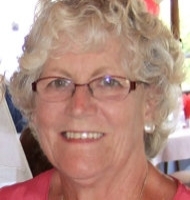 Sadly Mum’s eyesight has deteriorated further and other health issues are now apparent and perhaps even more worrying. 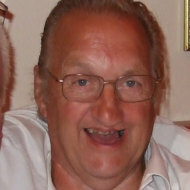 Recently diagnosed with dementia this cruel disease is progressing at an alarming pace. Having now completed a great many of my own projects I’m really pleased to see her reaction to the pieces. I tried to copy Mum’s style but I find it easier to develop my own. The two styles are clearly different and my own is very gradually getting more relaxed, free and faster which is really the idea. I don’t think I’ll ever be as accomplished as some of the hugely talented artists in the UK but, like Mum before me and indeed the original boat people, it’s more about enjoying the craft. A time will come when Mum will not understand what I’m showing her anymore. That will be a tough day but, a way off yet I hope? 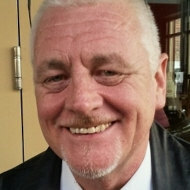 Most of all, as a lifelong canal and historic working narrowboat fanatic, my plan is to develop this website even more. The aim is to eventually make it a resource for everything related to the UK narrow canal network. In addition it’s relevance at the birth of the industrial revolution. In late 2017 and with Mum’s dementia becoming much more pronounced and agitated, I agreed with Dad that I should give him a break and take care of Mum on Wednesdays. We started on the pretext of her assisting me with some cleaning but, Mum’s Doctor also suggested she resume her painting as therapy. To try and keep her interest I pulled all my pieces and the remainder of hers together. I then added some shelves to create a pseudo physical store. This pseudo store of course needed to be dusted and re-arranged every Wednesday which kept us busy for a few hours each week. A few weeks later I’d prepared a some pieces in base colour for her. I asked her to paint some of the first layers for me and to much excitement she agreed and we began together. The ‘Guvnor” back on the brushes! Sadly and I think more from the now total loss of sight in one eye, the brushes went too far into the pots and it all got very messy indeed. When Dad picked her up later i wiped her work off, and made it all nice for the next week but, even though I convinced her of her excellent work the week before, she was clearly getting distressed at the mess and again said “I can’t do it anymore!” And that was that! Throughout 2018 Mum’s dementia progressed and the strain was now telling terribly on Dad too. The Wednesdays had to stop because Mum wouldn’t stay anywhere for more than ten minutes or so. 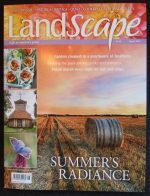 During the hottest summer since 1976 I was able to read to Mum this short feature in the August 2018 issue of ‘Landscape Magazine,’ and read it to her I did, often! So this is the story of ‘Carishei Canal Art.’ At February 2nd 2019 and after 23 years still for the moment a family business. In my mid 50’s I was presented with a chance to further bond with my Mum and I absolutely seized that opportunity. I’ll forever be glad I did! Warmest wishes to all readers.